A CALCULATOR MAY /VO 7 BE USED FOR THIS PART OF THE EXAMINATION. Directions: Solve each of the following problems, using the available space for scratchwork. After examining the form of the choices, decide which is the best of the choices given and fill in the corresponding oval on the answer sheet. No credit will be given for anything written in the test book. Do not spend too much time on any one problem. In this test: Unless otherwise specified, the domain of a function f is assumed to be the set of all real numbers x for which f(x) is a real number. The graph of y = h(x) is shown above. 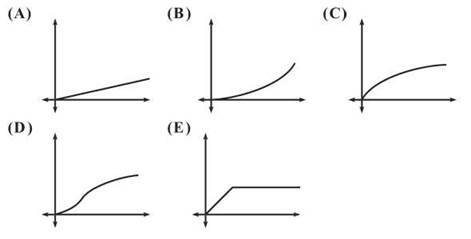 Which of the following could be the graph of h"(x)? QUESTIONS 7 THROUGH 9 REFER TO THE FOLLOWING GRAPH AND INFORMATION. The function f is defined on the closed interval [0,6]. 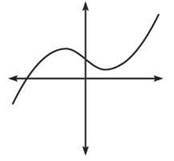 The graph of the derivative f' is shown above. 8. At what value of x does the absolute minimum value of f occur? 9. 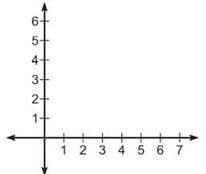 How many points of inflection does the graph of f have? 14. What is the approximation of the value of cos 2 obtained by using the sixth degree Taylor polynomial about x = 0 for cosx? 15. 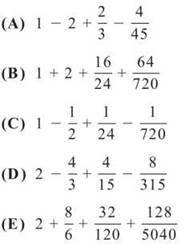 Which of the following sequence(s) converges? 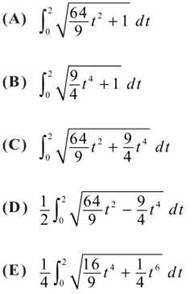 Shown above is the slope field for which of the following differential equations? 21. What is the instantaneous rate of change of the derivative of the function f(x) = ln x2 when x = 3? 24. What is the approximation of the area under y = x2 — 2x + 1 for 0 ≤ x ≤ 4 using the trapezoidal rule with 4 subintervals? 25. Let f be the function given by the first four nonzero terms of the Maclaurin polynomial used to approximate the value of ex. Determine the area bounded by the graph and the x-axis for 0 ≤ x ≤ 2. The graph of a twice-differentiable function f is shown in the above figure. Which of the following is true? STOP. END OF SECTION I, PART A. IF YOU HAVE ANY TIME LEFT, GO OVER YOUR WORK IN THIS PART ONLY. DO NOT WORK IN ANY OTHER PART OF THE TEST. A GRAPHING CALCULATOR IS REQUIRED FOR SOME QUESTIONS IN THIS PART OF THE EXAMINATION. 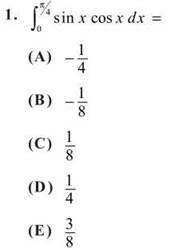 In this test: (1) The exact numerical value of the correct answer does not always appear among the choices given. When this happens, select from among the choices the number that best approximates the exact numerical value. (2) Unless otherwise specified, the domain of a function/is assumed to be the set of all real numbers x for which f(x) is a real number. 29. For what integer k > 1 will both and converge? 30. The volume of the solid formed when the region bounded by x = 0, and y = 0 is rotated about the line y = —2 is given by which of these definite integrals? 34. The acceleration of a particle is described by the parametric equations and If the velocity vector of the particle when t = 2 is (4,ln 2), what is the velocity vector of the particle when t = 1? 35. What is the average rate of change of over [2,5]? 36. Let f be defined as the function f(x) = x2 + 4x — 8. The tangent line to the graph of f at x = 2 is used to approximate values off. Using this tangent line, which of the following best approximates a zero of f? 38. The revenue from the sale of the widgets is 108x + 1,000 dollars, and the total production cost is 3x2 + 16x — 500 dollars, where x is the number of widgets produced. How many widgets should be made in order to maximize profits? 39. 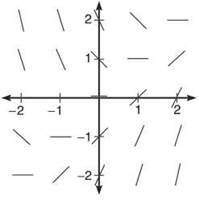 What are all the values of x for which the series converges? 42. 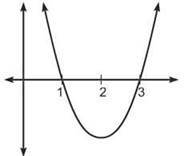 At which point is the graph of f(x) = x4 — 2x3 — 2x2 — 7 decreasing and concave down? 43. A population, P(t) where t is in years, increases at a rate proportional to its size. If P(0) = 40 and P(1) = 48.856, how many years will it take the population to be double its original size? 44. Let f be a continuous and differentiable function on the closed interval [1,5]. If f(1) = f(5), then Rolle’s theorem guarantees which of the following? 45. A particle starts from rest at the origin and moves along the x-axis with an increasing positive velocity. 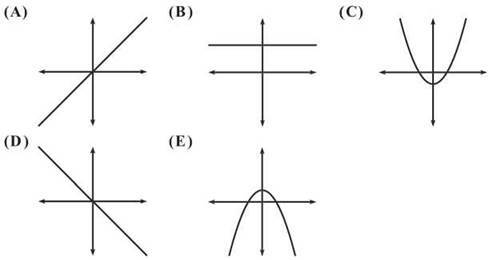 Which of the following could be the graph of the distance s(t) that the particle travels as a function of time t? STOP. END OF SECTION I, PART B. IF YOU HAVE ANY TIME LEFT, GO OVER YOUR WORK IN THIS PART ONLY. DO NOT WORK IN ANY OTHER PART OF THE TEST. A GRAPHING CALCULATOR IS REQUIRED FOR SOME PROBLEMS OR PARTS OF PROBLEMS IN THIS PART OF THE EXAMINATION. SHOW ALL YOUR WORK. 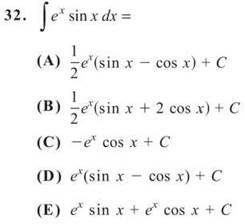 It is important to show your setups for these problems because partial credit will be awarded. If you use decimal approximations, they should be accurate to three decimal places. (a) Sketch the region R on the axes provided. (b) Determine the area of the region R.
(c) Find the volume of the solid generated when R is rotated about the x-axis. (d) The region R is the base of a solid. Each cross section perpendicular to the x-axis is an equilateral triangle. Find the volume of this solid. 2. The rate at which air is leaking out of a tire is proportional to the amount of air in the tire. The tire originally was filled to capacity with 1,500 cubic inches of air. After one hour, there were 1,400 cubic inches of air left in it. (a) Express the amount of air in the tire in cubic inches as a function of time t in hours. (b) A tire is said to be flat if it is holding 2/3 of its capacity or less. After how many hours would this tire be flat? 3. Consider the curve defined by 9x2 + 4y2 - 54x + 16y + 61 = 0. (b) Write the equation for each vertical tangent line of the curve. (c) The points (3,1) and (1,-2) are on the curve. 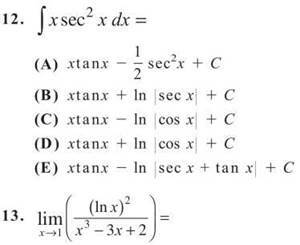 Write the equation for the secant line through these two points. 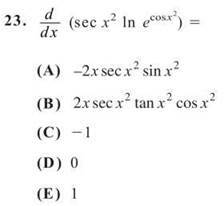 (d) Write the equation for a line tangent to the curve and parallel to the secant line from part C.
STOP. END OF SECTION II, PART A. IF YOU HAVE ANY TIME LEFT, GO OVER YOUR WORK IN THIS PART ONLY. DO NOT WORK IN ANY OTHER FART OF THE TEST. A CALCULATOR IS NOT PERMITTED FOR THIS PART OF THE EXAMINATION. Above is the graph of the velocity of a bug crawling along the x-axis over a six-second interval. (a) At what time(s) t, 0 < t < 6, does the bug change directions? Explain your reasoning. (b) At what time t, 0 < t ≤ 6, is the bug farthest from its starting point? Explain your reasoning. (c) Over what interval(s) is the bug slowing down? 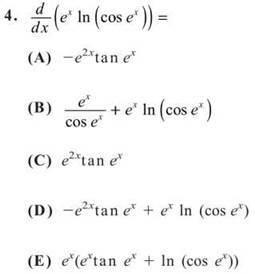 (a) Write a Cartesian equation for the curve defined by these parametric equations. 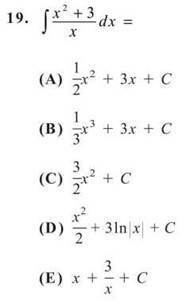 (b) Find dy/dx for the equation in part A. (c) Determine the velocity vector for the particle at any time t.
(d) Demonstrate that your answers for part A and part B are equivalent. (e) Write, but do not evaluate, an integral expression that would give the distance the particle traveled from t = 2 to t = 6. 6. Let be the fourth-degree Taylor polynomial for the function f about x = 1. Assume that f has derivatives of all orders for all real numbers. (a) Find f(1) and f(4)(1). 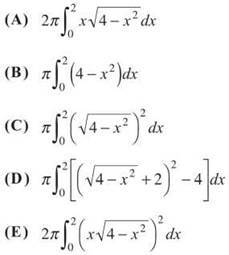 (b) Write the third-degree Taylor polynomial for f' about x = 1, and use it to approximate f'(1.2). 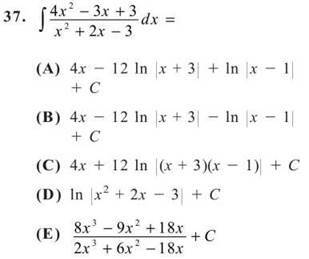 (c) Write the fifth-degree Taylor polynomial for about x = 1. STOP. END OF SECTION II, PART B. IF YOU HAVE ANY TIME LEFT, GO OVER YOUR WORK IN THIS PART ONLY. DO NOT WORK IN ANY OTHER PART OF THE TEST.